Chris has left the sunny expanses of Arizona and come north to visit his friend Martin for Christmas in his cabin in very snowy Wisconsin. But Martin gets a call of a relative passing away and has to leave for a funeral, leaving Chris to hang out in the cabin alone for a few days, in a blizzard that knocks out the electricity and keeps Martin from returning as quickly as he had hoped. Sunny-boy Chris just knows he’s going to freeze to death, alone. Horace shows up to check on the cabin and finds Chris alone and not really prepared to handle the weather. He helps out, shows Chris how to survive, and in the course of things gets a bit close and shares more than just body heat. Then he takes off, leaving Chris wondering what the heck happened. Chris has worked up a good anger and a nice emotional wall to keep things just friendly when Horace shows up again with an explanation and the desire to figure out if they are reacting to the snow or something stronger. 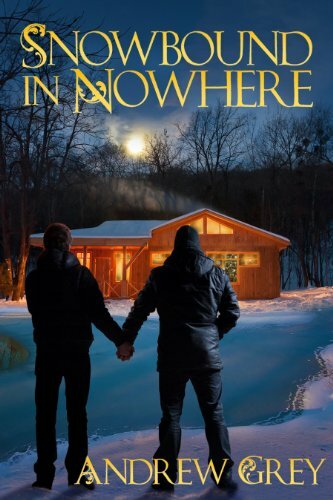 Andrew Grey has crafted one of the most beautiful, gentle, and hot stories of the season with Snowbound in Nowhere. I started off the novella thinking I was going to hate Chris, he was whining about the cold and snow, how he shouldn’t have come up to Wisconsin, and then upset that his friend’s family had a funeral to attend and Chris would be on his own for a couple of days. I started out hating this guy. Then came Horace, and with him, the icy grip of dislike that my heart held for Chris melted away as he and Horace explored each other and their feelings. Let it snow, let the electricity stay off, let Martin stay gone until summer, these two men made Christmas hot this season. One of the best things is the simple, basic, and beautiful love that develops between them. This is a first-time type of book, something readers don’t get treated to often and it works so very well here. I actually finished the book and started putting down a list of people who needed to read it for a Christmas present, I loved it that much. Give yourself an early gift, get Snowbound in Nowhere. Even better, pick up a copy for a friend or two, they will love it too.